← Who is the dreaded Carpenter? He’s the perfect superhero for the ADHD Internet era. Completely wacky, extremely violent, and just a hint of self-loathing, Deadpool has rocketed in popularity over the past decade. 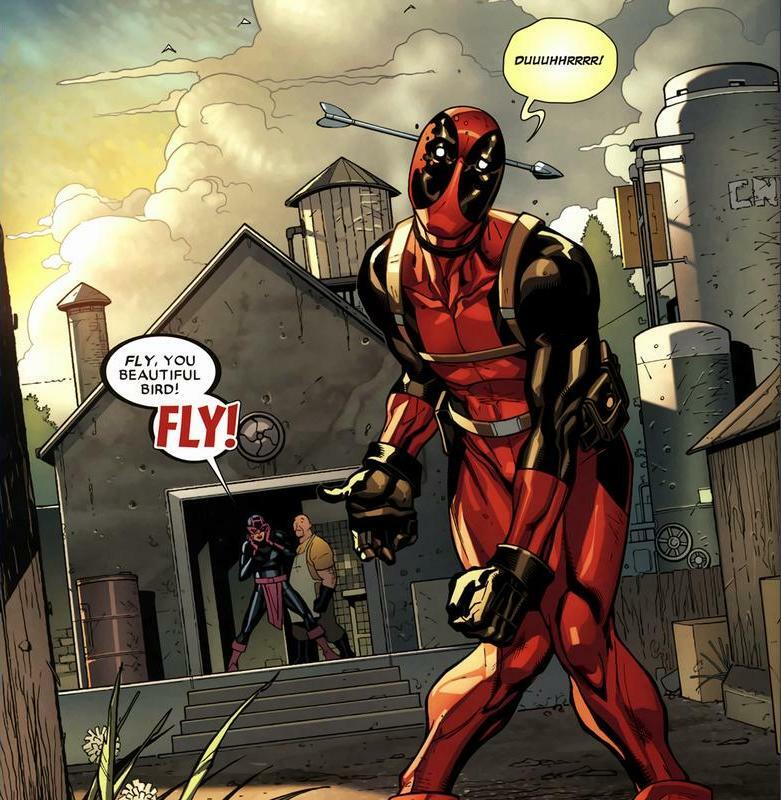 If you want to keep up with the youth in up and coming superhero fads, you need to know about Deadpool. 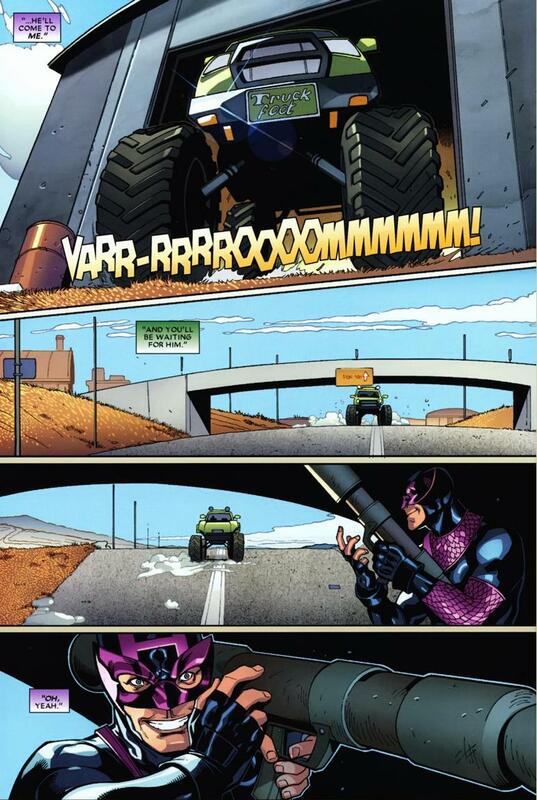 Plus, all of his series are fantastically written and delightfully fun. A little backstory to get you caught up before we divulge into our issue for today. 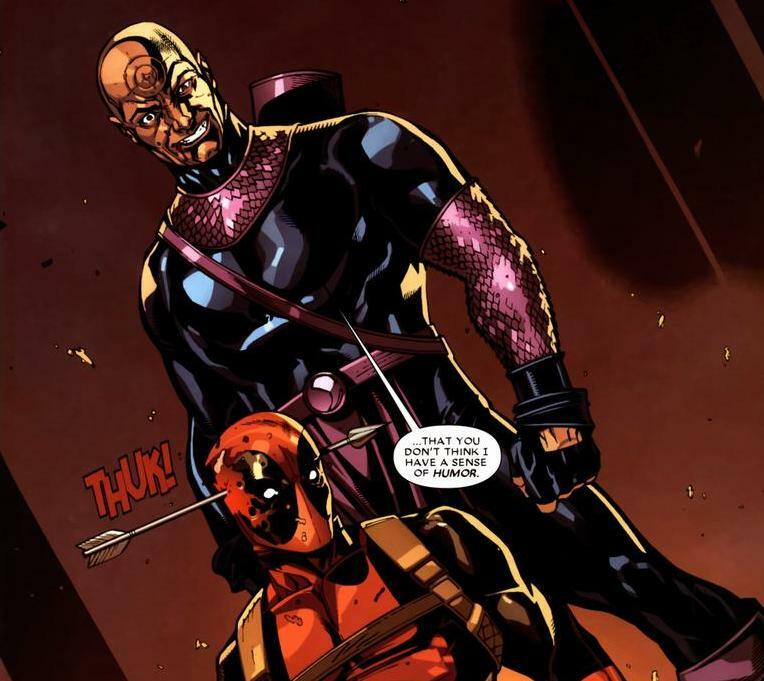 Deadpool, real name Wade Wilson, is a product of the Weapon X program, which you may know as the main reason for Wolverine’s angst and memory loss. 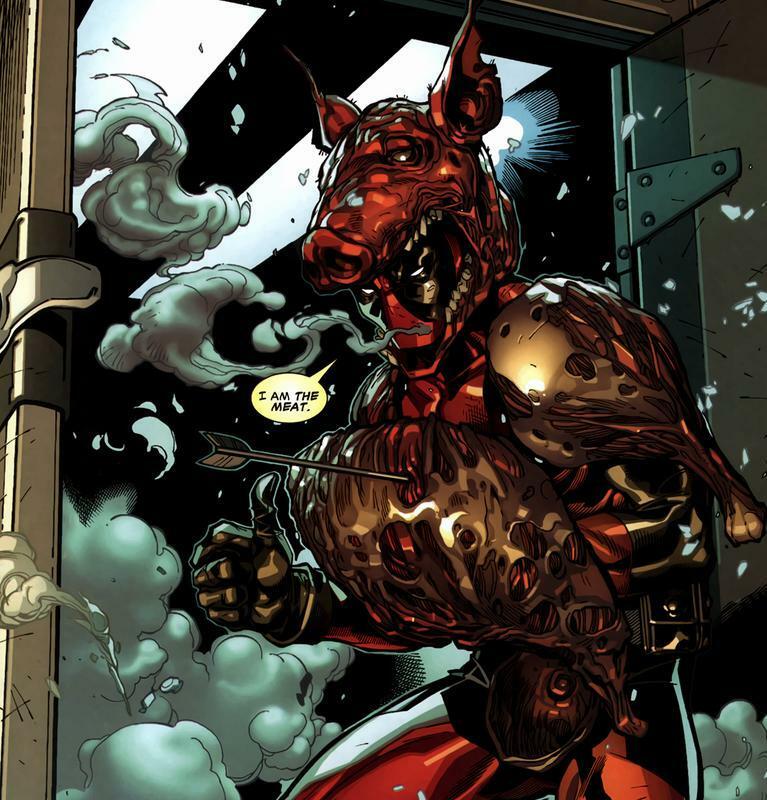 As a science guinea pig, Deadpool was given Wolverine’s mutant healing factor. Unfortunately, that also sped up the growth of the cancerous tumors he happened to have and left his body horrible scarred and disfigured. But hey, at least he heals fast, and coupled with his extensive military training, makes him a formidable mercenary and assassin. You still might be asking, what’s so special about a Wolverine ripoff? Well, he doesn’t have claws. More importantly, he’s insane and I can’t stress how literally I mean that. 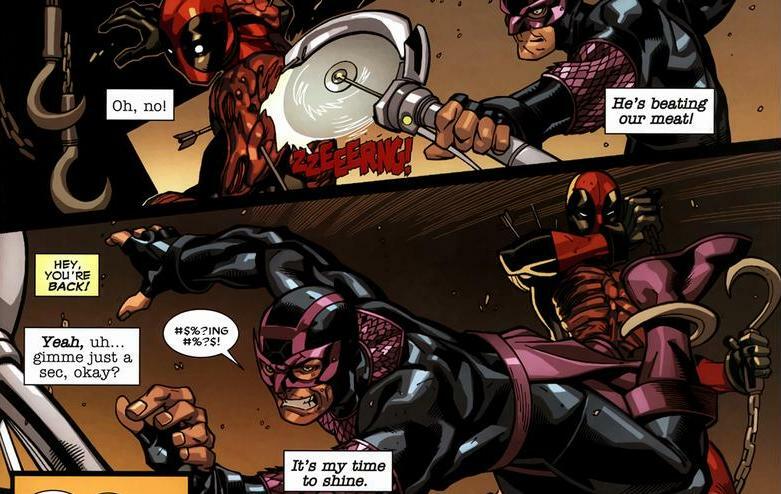 Allow me to provide proof using his battle against Bullseye in Deadpool #10 through #12, written by Daniel Way. Real fast: Norman Osborn, the Green Goblin, has created a team of Dark Avengers. 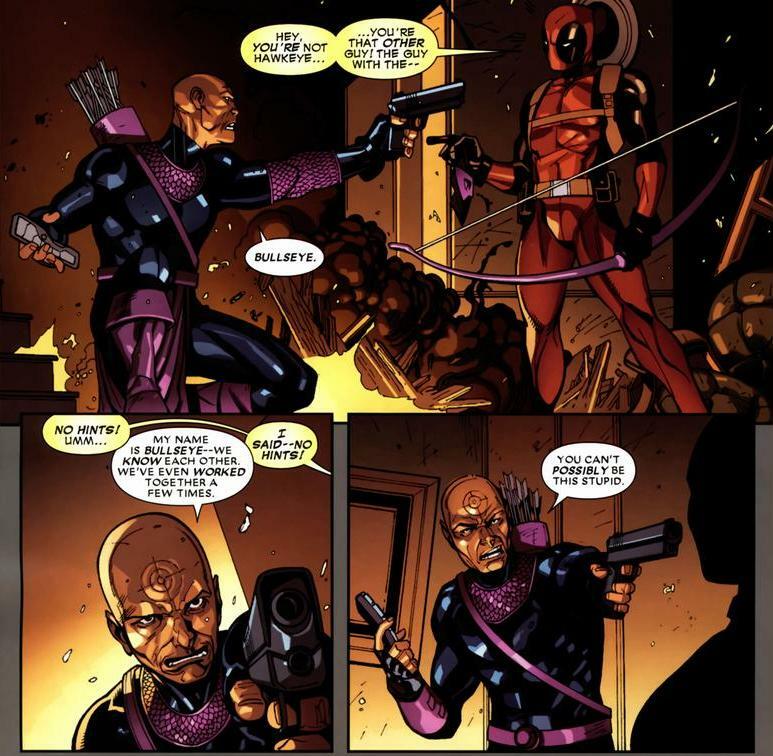 Bullseye, pretending to be Hawkeye, is sent after Deadpool to get rid of him. 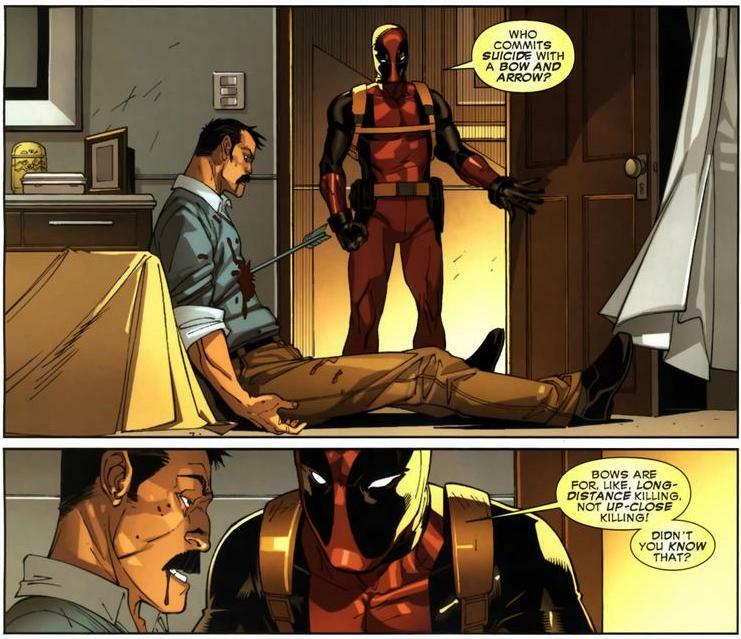 Deadpool has just robbed a house when he goes upstairs to check on the owner. 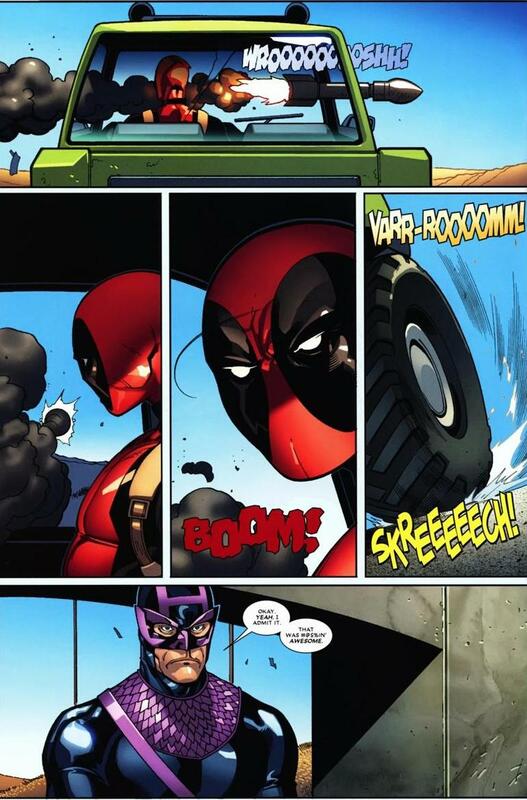 Yeah, so Deadpool’s not exactly a superhero. One guess to figure out who’s the assassin. 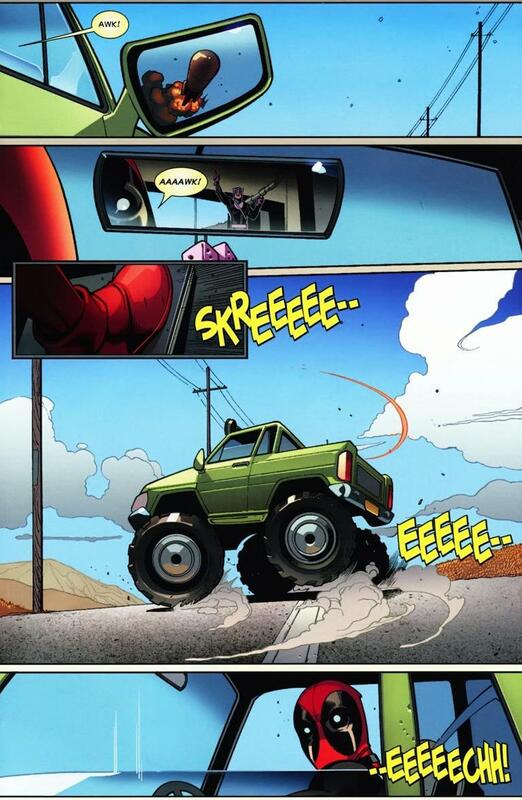 Bullseye and Deadpool scrap for a few pages, because it’s why we read comics in the first place. 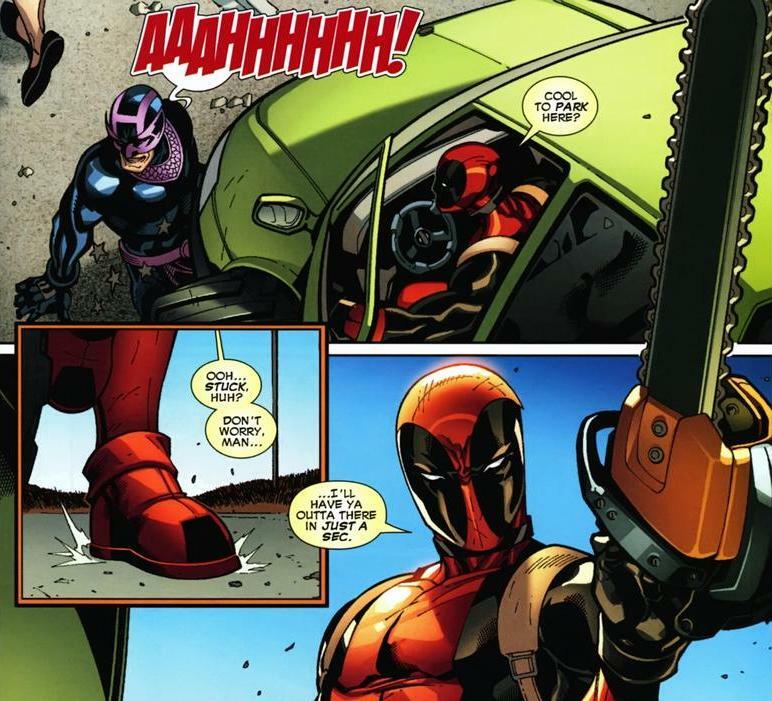 That healing factor makes Deadpool pretty much invincible. Around forty issues later, the Hulk will punch Deadpool so hard that his body liquefies, and he’s back to normal a few days later. So while an arrow through the brain ain’t physically lethal, I imagine it does screw up a few cognitive processes. Probably. I’m not a scientist. 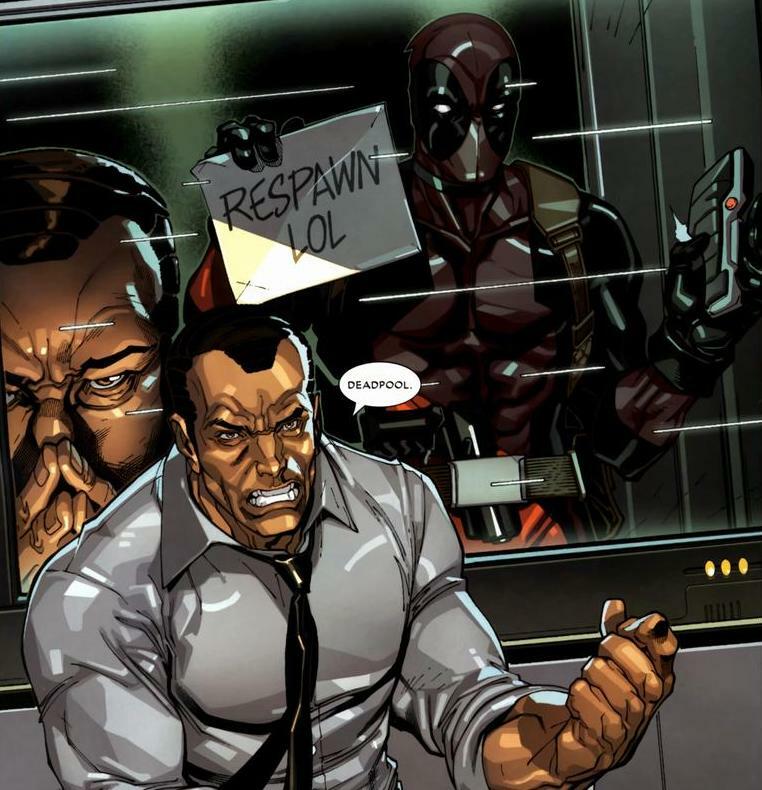 Want to take a guess about Deadpool’s reputation in the superhero and supervillain communities? Did you say universally hated? 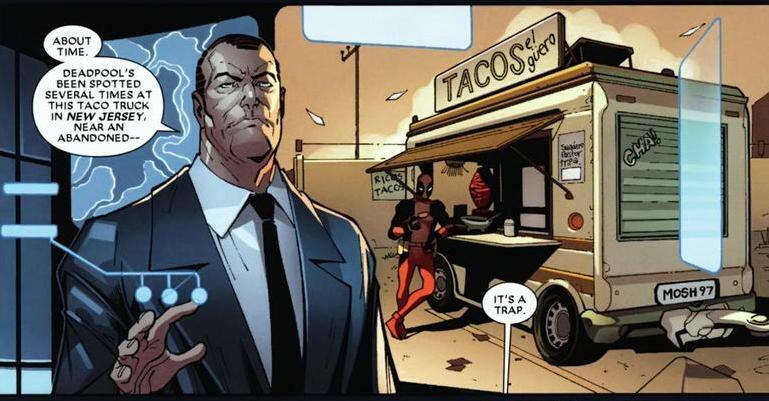 Yeah, Deadpool isn’t getting invited to any late night poker games. Though don’t feel bad for him, because in a world where a blue furry mutant cat can get an attractive normal green-haired girlfriend, the fault lies entirely with Deadpool. He’s kind of a loose cannon – oh, and a moron. But it’s because of how crazily stupid he is that we get moments like these. 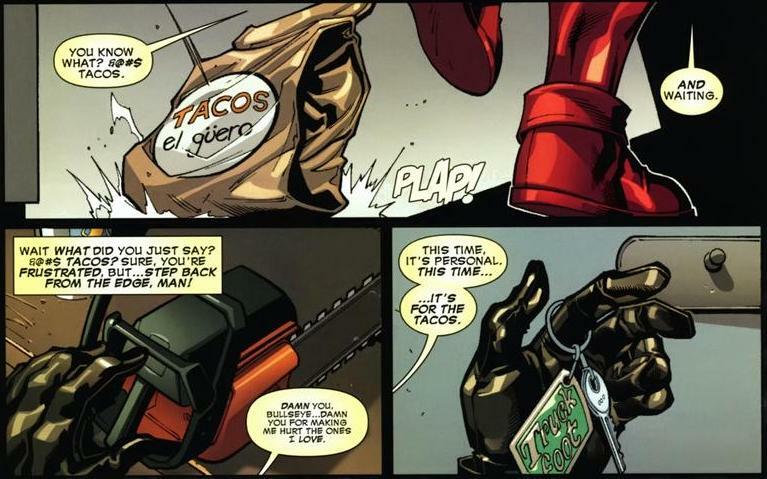 Moments that etch Deadpool’s name permanently into the annals of the Marvel greats. Moments such as the three full pages you’re about to read. You see, even as funny as Spider-Man’s comics are, they’re still surrounded by monologues and scenes of Spider-Man’s frustrating anguish and the burden of responsibility. These make him more relatable and the reader roots harder for him to win. Deadpool comics don’t bother with those, because Deadpool’s a silly, spontaneous character who’s lacks any sense of accountability for his actions. Other superhero comics deal with their protagonists overcoming overwhelming odds to persevere in the face of adversity and those are fantastic stories, but Deadpool’s about fun and he’s found a major following because of it. The irony is that his dickish behavior’s the reason he’s so loved. And if you’ve found yourself emotionally invested in this story and want to know how it ends, you’re in luck. 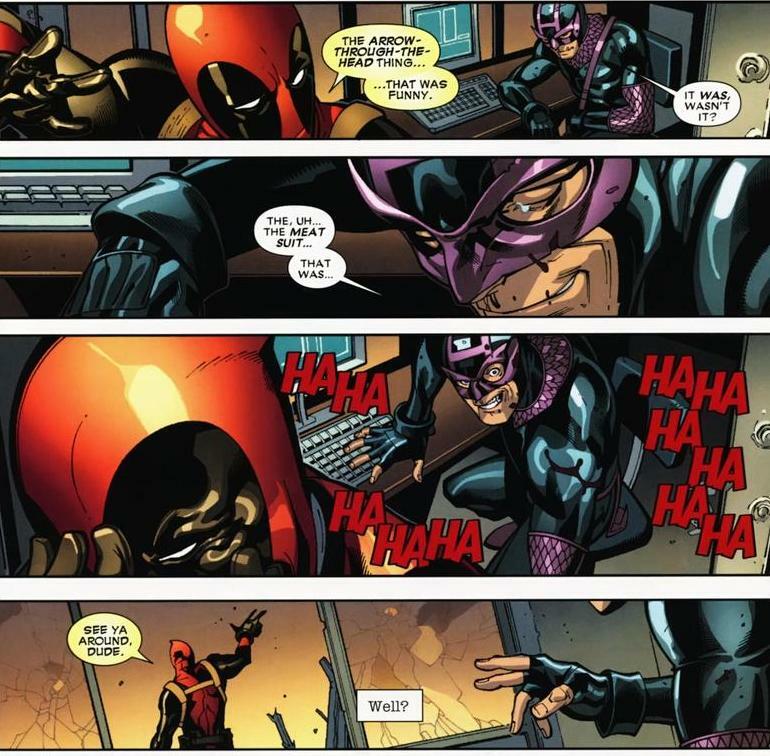 Bullseye and Deadpool go back to being sort of friends. Why? 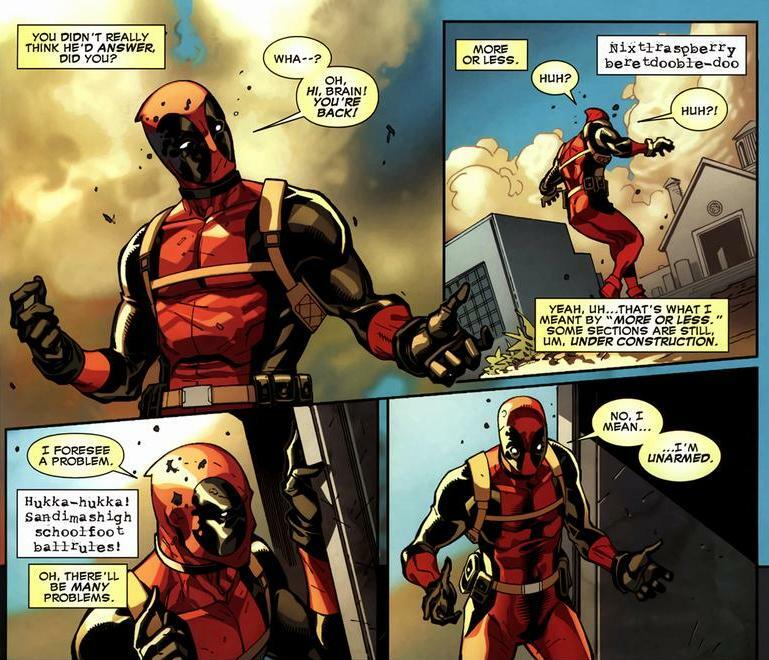 Because the unifying theme in all his adventures revolves around Deadpool not giving a crap. Cue the next arc where he decides to join the X-Men and the arc after that where he fights a macaque monkey assassin with Spider-Man. You’re damn right you want to read it.